Summer is here and for many of us that means baring more skin! I know personally I could do with working on my core and booty a bit more so why not kick start a fun 5 day challenge! Please not this challenge is held on Facebook in a PRIVATE group, so in order to join you need to have a Facebook account! Each day I'm going to provide a workout of the day that targets your derriere and your core. Your goal is to get those workouts in and post your sweaty post workout selfies, or better yet, share a video! For 5 days we'll focus not only on workouts but tackling your nutrition too. I don't expect you to make a complete nutrition overhaul during that time, but my goal is to help teach you some tips and tricks for making changes in your diet to help you through the summer. Together with fitness, nutrition and accountability (active participation in our group) you've got your recipe for success! Fun, fitness and fabulous giveaways! Once you join this event I will send you a friend request from my personal Facebook. My name is Julie Russell so be sure to accept! This will allow me to add you to the private facebook group I have created. I will message you to discuss your personal goals so I can best support you during this challenge. 2. You must not be currently working with another Beachbody Coach. If you are, please contact them about their upcoming groups. I will message you and share more information on how to get yours before the group starts. 4. You must be willing to participate daily and be actively engaged. These groups don't work unless you do! We are all in this together to support one another. 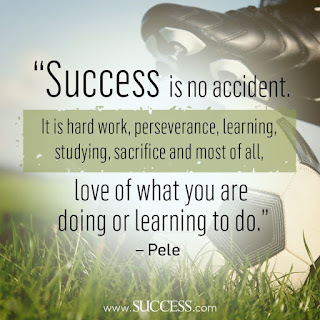 I will provide the tools and resources you need, all you need to do is commit to being an active participant so you can benefit most from this week! Memorial Day is right around the corner and for many of us that means traveling to see loved ones or spending a fun weekend away. 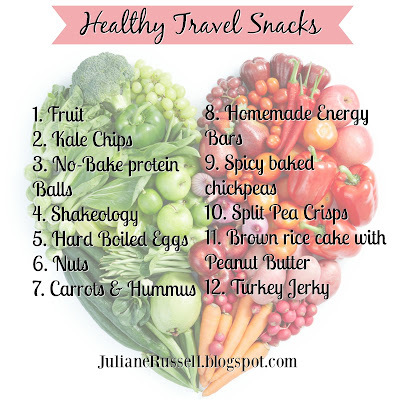 But staying on track with our goals can be challenging on the road, so here are some healthy travel snack suggestions to keep you from hitting up that drive through! Remember, planning ahead is KEY! High in fiber and water content, fruit will keep you full AND hydrated (but don't skip that bottle of water). If you're looking for mess free suggestions that don't leave trash behind, opt for pit or stem free fruits like grapes, raspberries, figs, pre-chopped strawberries and banana slices. Low in calories and high in Vitamin A, Kale chips are super easy to make but you can also find some in stores (check the ingredients to see how they are prepared!). Just be sure to check your teeth before you get out of the car! Packed with healthy fats and protein to keep your energy levels up, these also serve as a great sweet tooth snack. Just watch your portion control! With over 70 superfoods, Shakeology packs a nutritional punch you'll be hard pressed to find elsewhere. Equivalent to several servings of salad, Shakeology not only helps to keep you full for 2-3 hours, but it boosts your immune system, improves your digestion and helps reduce internal inflammation. It comes in a variety of flavors. I even keep a shaker cup and packet in the trunk of my car for emergencies! Message me if you're interested in trying this or getting a discount on a month's supply. Great for a quick energy boost, hard boiled eggs are loaded with B vitamins too! Pretty tasty on their own, carrots provide a satisfying crunch and natural sweetness, but if you need something to dip them in, try some travel containers of hummus or make your own and portion it out. Wild Garden Hummus Dip comes in 6 flavors and doesn't need to be kept in the fridge! Hummus provides you with protein and a number of essential vitamins and minerals. While it can be high in fat, it's mostly heart-healthy, unsaturated fat. Again, just be conscious of portion sizes. 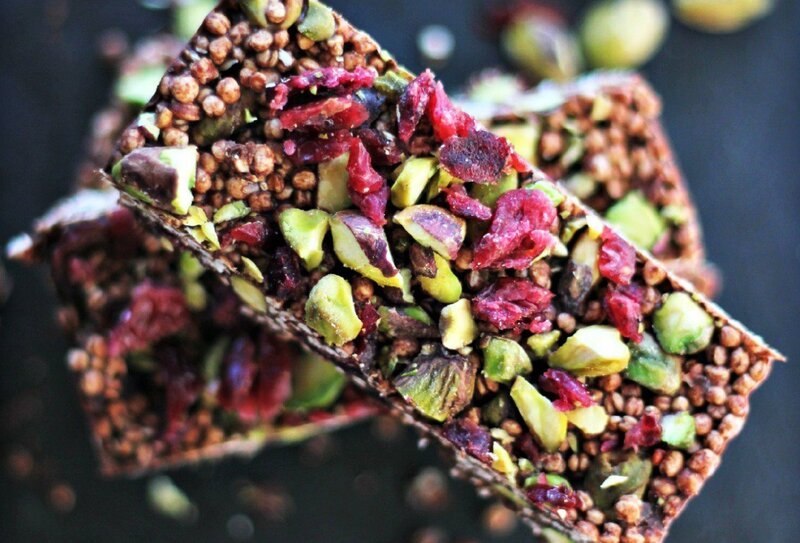 Store bought energy bars can be loaded with sugar and artificial ingredients, but luckily it's pretty easy to make your own and the recipes available are endless! 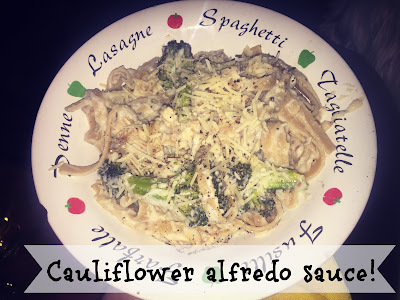 Packed with protein and good, healthy fats, these are a great on the go option that you can double up portions on and freeze the rest for later! Check out these sites for some great recipe suggestions. Roasted chickpeas are lower in calories than nuts but still provide a satisfying crunch. Incredibly versatile there are tons of ways to spice or sweeten these bad boys up, depending on your preference. 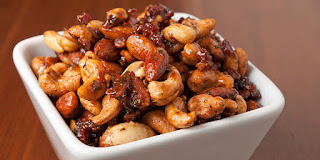 Here's a great Baked Smoky Paprika Chickpea recipe! 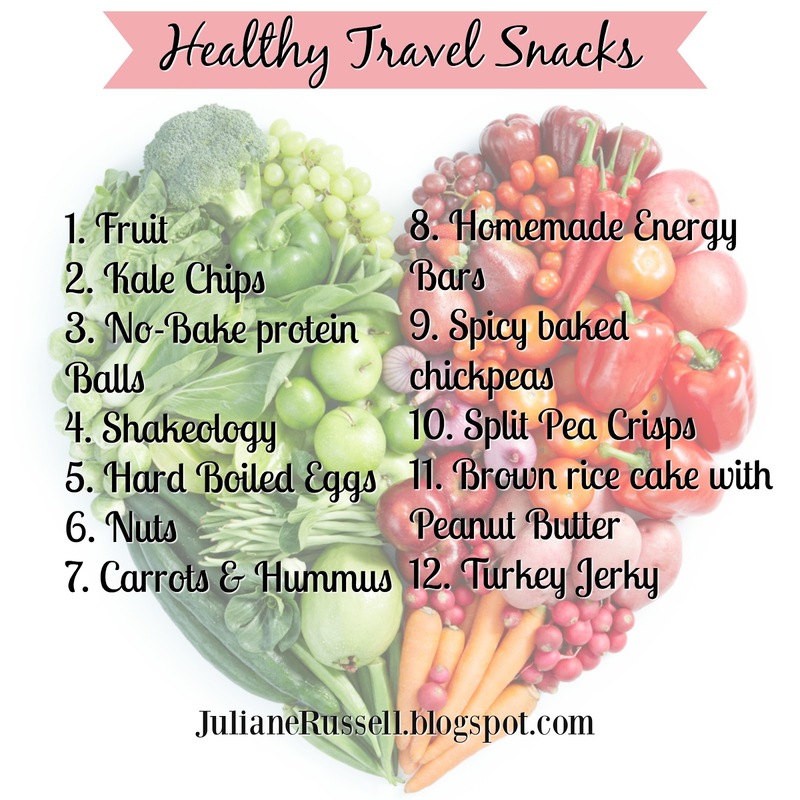 Peas are excellent for you because of their high fiber content and vitamins A & C, but I'm pretty sure not many of us like to snack on them on the road. Split Pea Crisps however are another story and becoming easier to find in stores (just be careful of the ingredients). Better yet, make your own with this recipe from Whole Living, that combine peas with just a touch of olive oil and salt. Rice cakes are a great high fiber, fat free snack that are low in calories. 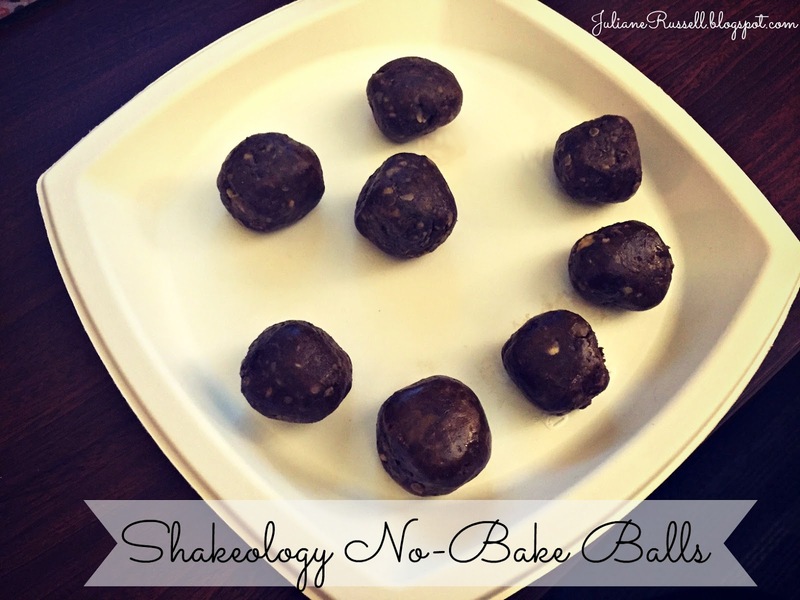 Add some healthy fat and protein from Peanut Butter and you're good to go! 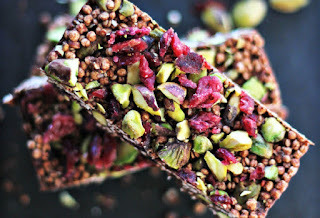 High in protein and low in calories, this is a better for you alternative to crackers, chips and some store bought bars. Check out Krave Jerky for a variety of flavors. I made these for the first time on Cinco de Mayo and could not have been more impressed! 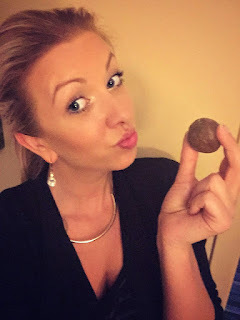 I'm not a massive tequila fan but these were out of this world and I'm sure will be a staple over the summer! 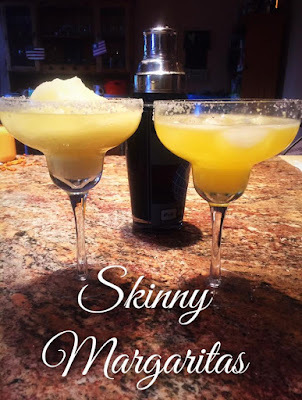 These margaritas are a meager 184 calories versus around 550 calories for your average restaurant or homemade margaritas made with powder blends instead of fresh ingredients! Pour salt on plate. Run lime wedge around glass and dip in salt. Pour tequila, lime juice, orange juice and agave into a cocktail shaker over ice. Shake for 30 seconds. Pour in margarita glass over ice. Pour tequila, lime juice, orange juice and agave over 1 cup ice in blender. Blend until frozen. **TIP- If you like your margarita's a little on the sweeter side, cut back one portion of lime juice and add 1-2 portions of orange juice extra to your liking. Are you a fresh or frozen fan? Comment below! 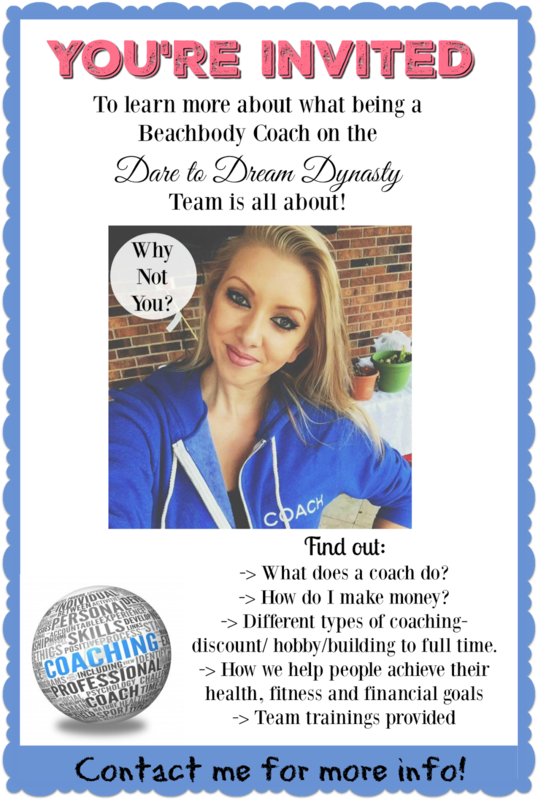 Why Beachbody Coaching is for me, and could be for you too! or complete the application at the bottom of this post. Before I get into my story, let me ask you.....are you someone who dreams of a better life? Are you working a job that makes you miserable? Are you into health and fitness? Have you tried a Beachbody workout program and enjoyed it? Do you try to eat clean and live a healthy lifestyle? Do you want more for yourself and your family but don't know how to get it? If you answered YES to any of these questions (doesn't have to be all of them), then read on, because I may have an opportunity that could be of great interest to you. Last week was a pretty eventful week for me, and since I was traveling I didn't really have a chance to digest all that happened. Now that I have, I sit here in awe and feeling totally blessed! 10 months ago I started this whole Beachbody coaching thing working full time while also doing contracting work on the side. I could have given myself the excuse that I was "too busy" to add something more to my plate, but I knew I wanted more in my life, wanted more fulfillment from my career and wanted something that excited me each day. I found that in coaching and haven't looked back since. 1 round of 21 Day Fix results from one of my challengers! Every day I get the chance to work 1 on 1 with people on their health and fitness goals. I get to be a part of their journey, motivating, inspiring and pushing them each day to be the best version themselves they can be, to reach goals they have struggled to achieve and there is NOTHING better than getting a message from a challenger who is excited about their progress and results. I took a leap of faith with a company that was changing my life....emotionally and physically. I wasn't sure how it could help me financially, but I figured, I'll give it my ALL, I'll give it my best shot, and go from there. I had seen the success other coaches were having and decided, "Why not me?". Why couldn't I have that to? Notice how I said "I'll give it my ALL", because this is not an opportunity for those who expect to jump right in and be successful without putting in the time, effort and work. But it IS an incredible opportunity and this week is pure proof of that! 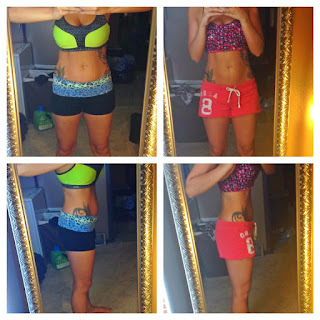 People were asking me about my results from Beachbody's programs and I knew I wanted to help others get results too. When I started coaching my biggest fear was not being sure I knew how to be a coach, but my team has the most incredible training and resources available that have helped me to grow my coaching business and will in turn help you too! We all work together, supporting one another not only with our business goals, but also our own personal fitness goals! I've worked hard over the last 10 months to grow personally and professionally and the benefits are paying off. I received my qualification email for the 2017 Punta Cana trip to the Hard Rock Resort through Beachbody and so far I'm earning this for free (ON TOP of my weekly Beachbody earnings). I had the opportunity to surprise my very best friend from Northern Ireland on her birthday vacation in San Diego last week...which without a doubt financially would not have been possible without the assistance of my income from Beachbody. I advanced my business not one level but 3 levels all at once, which means my team is growing and my business is growing. i had given myself a year to accomplish this....a milestone I was skeptical I'd hit, and I did it in 10 months. I look at this and literally do a happy dance because 10 months ago I only dreamed these things would be possible and here I am, doing the damn thing!!! This opportunity has been the BIGGEST blessing in my life and I am so excited to have the chance to pay that forward! So let me ask you the same question I asked myself....."Why Not YOU!". I am looking for 2-3 more women to mentor on my team and help get started with your own online health and fitness coaching business! 2-3 women who want the opportunity to create financial stability and freedom for themselves, who are working on their own health and fitness goals, and who would love the freedom of a career that could one day allow you to work from anywhere. I would love to share with you more about what coaching has done for me and the opportunities available to you too. You never know what opportunities can change your life until you take a leap of faith to learn more! Please complete my coach application form below if you have an interest in talking further and learning more! ***And to keep corporate happy please remember that Beachbody does not guarantee any level of success or income from the Team Beachbody coaching opportunity. 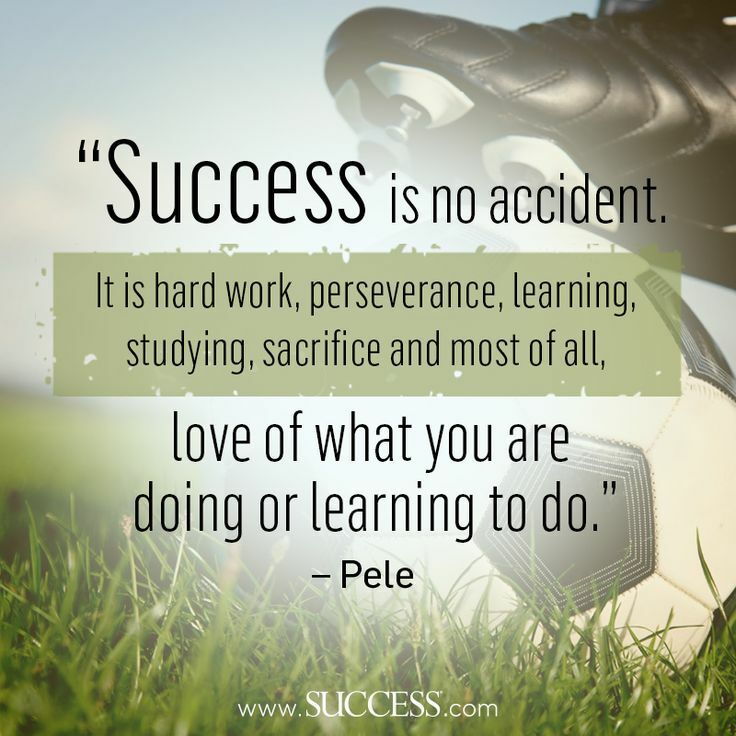 Each coach's income depends on his or her own efforts, diligence and skill. Pressed for time? Squeeze this ab workout in, just about anywhere!! Sped up and cropped so it's not 10 mins long!